Nokia has just launched the latest notch-toting smartphone in its lineup — the Nokia 7.1 (first impressions) in India. 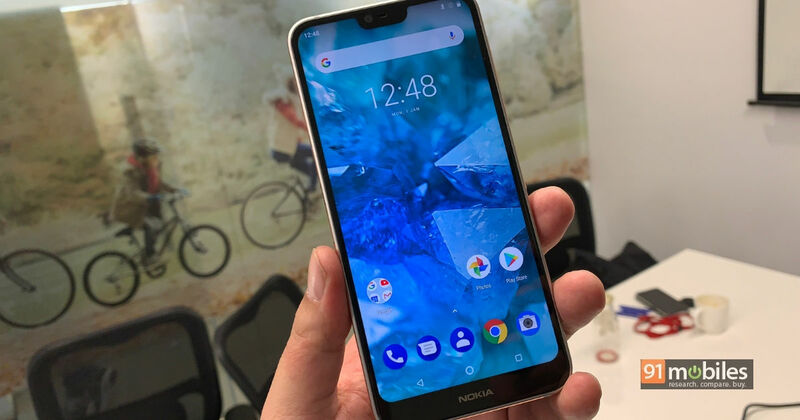 As can be expected, the handset brings all the signature characteristics of Nokia, along with introducing a first for the brand… as the 7.1 offers support for HDR display, a feature that’s usually reserved for flagships. But is that the only thing that makes the smartphone worth watching out for? Stay with us to find out. The Nokia 7.1 comes equipped with a 5.84-inch IPS panel, which flaunts 19:9 aspect ratio and 2,280 x 1,080 pixels. The notch-toting display has also been layered with Corning’s Gorilla Glass 3 glass for protection against scratches and minor knocks. But that’s not all, the 7.1 sports PureDisplay technology, which allows the phone to offer HDR support, which is unheard of in the mid-range segment. Not only does the smartphone offer an immersive viewing experience with compatible videos as it comes with the HDR10 standard, but the handset can also do SD to HDR conversion in the real-time. In our review of the Nokia 6.1 Plus, we proclaimed that the handset offers a lot for its asking price of Rs 15,999. The latest Nokia 7.1 comes with an identical spec sheet, which means you can expect smooth performance. The smartphone gets the Qualcomm Snapdragon 636 chipset backed by Adreno 509 GPU. The processor is further mated to either 3GB or 4GB of RAM depending upon the variant you go for. The former comes with 32GB of native storage, whereas the latter has 64GB of storage onboard. Thanks to the support for microSD card, you can extend the storage by up to 400GB. Sadly, you’ll need to let go of the secondary SIM slot if you wish to utilise the expansion slot. The Nokia 7.1 comes with ZEISS-branded 12-megapixel snapper accompanied by a secondary 5-megapixel shooter on the back. For selfies, you get an 8-megapixel camera on the front. While the rear cameras offer bokeh mode, the front snapper also offers software-based Live Bokeh mode. Further, the handset comes with the proprietary Bothie mode, which lets users stream both sides of the story using both the rear shooters and the camera at the fascia at the same time. Like every other Nokia smartphone, the 7.1 ships with Android One branding. The handset boots Android 8.1 Oreo out of the box, and will get an update to the 9.0 Pie iteration in November. The bloatware-free edition of Google’s mobile OS also ensures smooth performance since the resources on the phone aren’t bogged down by a heavy skin or unnecessary apps. The Finnish brand has also promised major Android updates for the next two years and three years of monthly security updates for the Nokia 7.1. Nokia 7.1’s sports a 3,060mAh battery, which also supports fast charging. This means, not only does the smartphone lasts longer on a single charge but also charges up quickly. According to the brand, the Nokia 7.1 has been rated to offer up to 19.5 hours of talk time, 17 days of standby time, 14 hours of music and 8 hours of video playback. These are the top features of the newly-launched Nokia 7.1. The smartphone has been launched in 4GB + 64GB configuration in the subcontinent and will set you back by Rs 19,999. The handset is available from top retailers in the country as well as Nokia’s official online store.